The African pot house can comfortably seat 8 people for drinks or 6 for dinner at the table But that's not all, the table can be also recessed into the bench, making one big flat bed 2.5m round, ideal for just 'chilling. 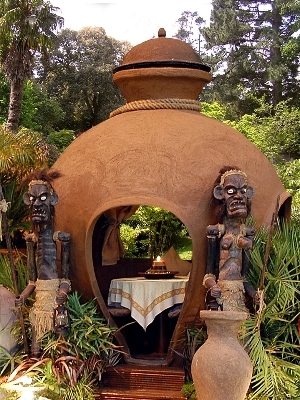 The African Pot House has a tented ceiling, rustic matching cushions and curtains and a suspended candelabra that makes it a fantastic evening recluse. Our Pot Houses are made individually to order so window positions can be altered to suit your tastes. The African Pot House truly does transcends the Ages it does not matter whether you are 7,17,47 or 77 everyone loves the ambiance of the pot house . We have successfully delivered the Pot House into Pubs ,Restaurants, Garden Centres ,and private homes(Click here to see some Pictures ), some requiring cranes to lift them over 3 story houses ,while others have been simple dolly deliveries. So if you would like one of our pot houses in your garden call us and we will find a way of getting it in .CLICK HERE FOR PICTURES OF Installation. African Pot House Standard ( Pot house, Seating System with Drop Down Table, Steps,and domed Top with soft Furnishings Inc ( tented ceiling, Rustic Curtains with curtain pole , window blinds, seat back cushions, main seat cushion and 3 loose scatter cushions. Please note the usual delivery time for this product is about 60 days from order . Delivery and installation using our dolly over level ground is included to England destinations for scotland or offshore destinations a surcharge will apply. In some locations a teleporter or a crane will be required this will be charged additionally and paid by the customer directly to the crane company. costs for this vary from place to place and can cost from £250-£750 for a 20 minute single lift . Please call us if you have any questions relating to this product .